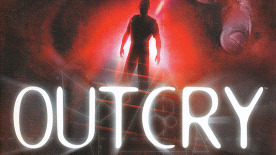 Outcry combines elements of classical Myst-like adventure games, along with author's approach to visual and audio environment. The interactive soundtrack has been designed for the game by Anthesteria project. The main character receives an invitation letter from his brother - whom he hasn't seen for years, and decides to visit him. However upon arrival, the writer receives news about sudden disappearance of his brother and as he finds out, the scientist has been secretly working on a mysterious machine, which could separate one's consciousness from his physical appearance.